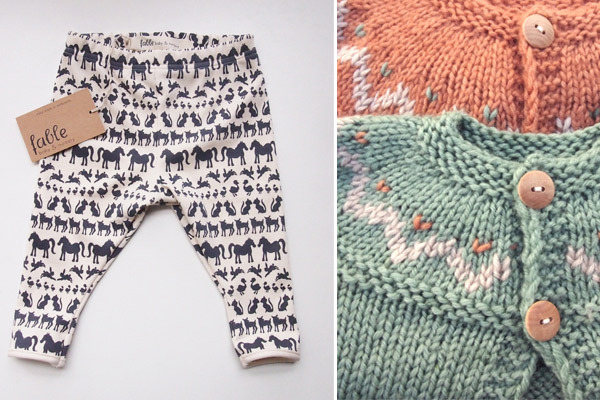 Fk chats to creative cousins Prue & Phoebe the team behind the gorgeous Melbourne based label Fable Baby & Nursery! They will also be debuting at the Melbourne Markets! 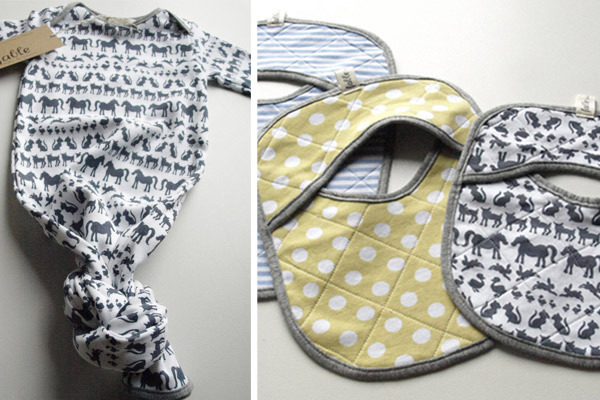 Tell us a bit about Fable Baby & Nursery and what products we can expect to discover? 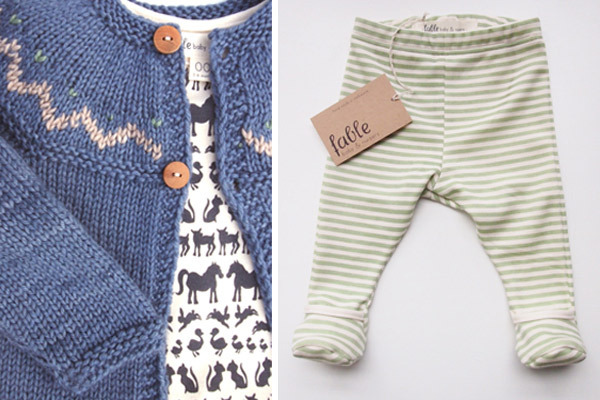 At FABLE, we design, print and hand-make clothing and accessories for babies, mothers and the nursery. 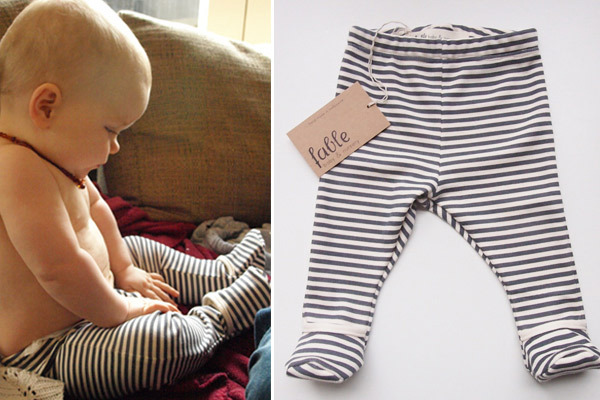 We launched our first range at Craft Hatch in June, which includes organic cotton hand printed leggings, tops, onesies, hand quilted bibs and muslin wraps; organic and Fair Trade cotton overalls and pinafores; hand knitted and hand dyed Australian wool jumpers, cardigans and beanies and hemp/cotton hand printed cushions. We are all about simplicity and subtlety – we don’t like baby labels that smack you in the face with a dodgy slogan or fluoro image, so we have designed simple, timeless patterns and teamed them with super soft natural fibres to create a gentle, calming aesthetic. Well, we are cousins so we’ve known each other since 1987 when Phoebe was born. 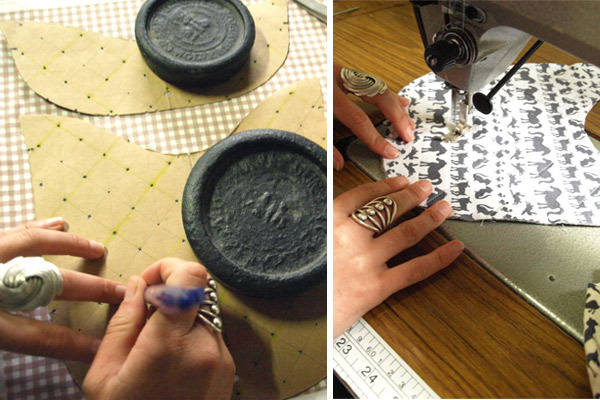 We’ve grown up together and have always shared many common interests – fashion, art, craft etc. In December we were out Christmas shopping, looking for a nice gift for Phoebe’s newborn baby nephew Harry – we realized there was a huge gap in the market for quality, hand-made, organic babywear… I had just finished studying Textile Design & Development at RMIT and Phoebe had just left her job at Scanlan and Theodore, so we toyed with the idea of starting our own label. At first it was just a pipedream, but the more we thought about it, the more we wanted to make it a reality. So we did! We signed up for the NEIS program, scrounged together some cash, completed a 7 week business course and started putting together our first range… And we haven’t taken a breath since! We are both serial interwebbers, so much of our inspiration comes from things that we see on online. We have recently discovered Pinterest, which we have started using to keep track of all that inspire us – photography, print, products, artwork and colour. We keep our senses tuned to the trends and fashions that are going on around us, however we don’t let them dictate our own aesthetic. 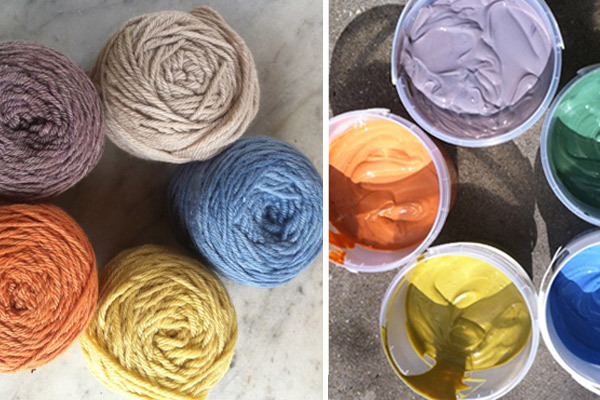 When it came to our first range, colour was paramount. Like many others, we’re sick to death of the whole “pink for girls, blue for boys” idea, so we set out to create a colour palette that was soft and gentle and worked well for babies of both sexes. 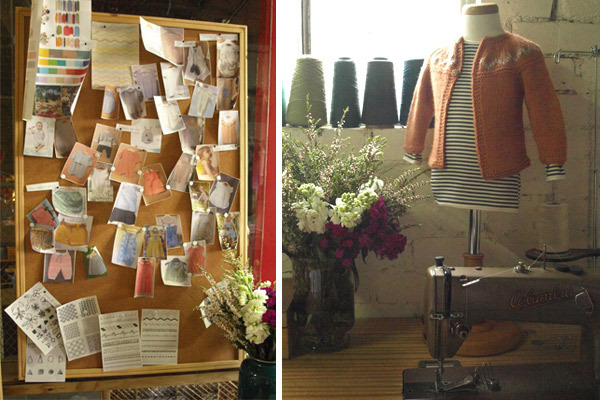 Our little studio is situated in a very old warehouse in Brunswick. Our space is a large square which has been built in by our very lovely landlord Mick, and is made out of old doors, wooden slats, glass and perspex panels. It has a little bit of a fishbowl feel, but not in a bad way. Mick is a mad collector of wood – reclaimed timber panels, old roof slats, fence palings, as well as old bits of furniture. We’re surrounded by so many things that were once beautiful, and could be again with a little bit of love. It has inspired us to use reclaimed timber to create clever bits and pieces for the nursery, with the help of our woodwork extraordinaire The Good Thief. We will be launching these at the Finders Keepers in Melbourne in October. MONEY. TIME. SPACE. Like any new small business, money is always a challenge during the set up and initial launching stages. 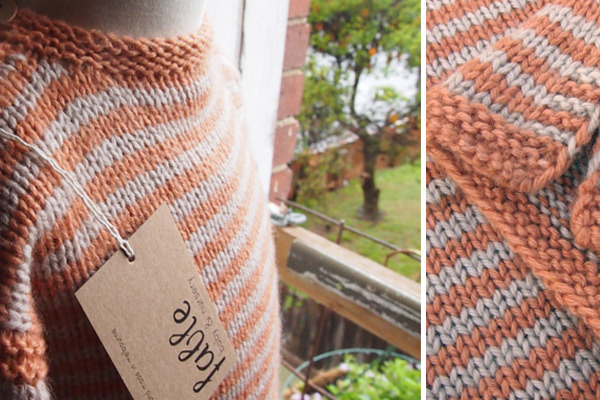 To survive we both have casual hospitality jobs which mean time away from the studio… As we are designing and making all of the pieces ourselves (except our little knits which we are getting some help with – thanks Mum and Angie!) time is so important. We are constantly juggling production time with design, admin, marketing, photography and everything else that goes with running a small business – but we wouldn’t have it any other way! At the moment, we are doing all of our printing at the Harvest Workroom after hours, so we’re often there well into the night. This is physically very demanding, and we have to be super organized to be sure we’re not wasting our time. We are so envious of the wonderful space the Harvest girls have created, and one day hope to have a similar printing space all of our own! We can’t wait to get the nursery side of things rolling along, and we hope to get to Finders Keepers in Sydney and Brisbane next year. We are madly working on a new range for summer, which will include hand painted muslin wraps and cotton knits and other pretty bits that you’ll just have to wait and see! What a lovely article. These girls are most definitely going places, and as someone who has seen and touched their products, first hand, I can tell you that they are absolutely gorgeous. It is so refreshing to have something other than pink for girls and blue for boys— their sunny yellow and apple greens are so delectable. 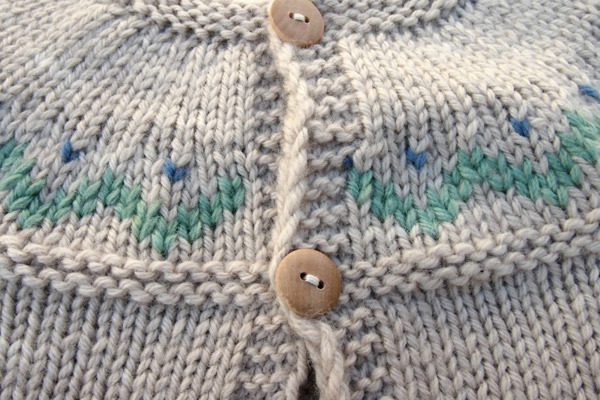 My little son has two of their cardigans and they are both functional and so very sweet. 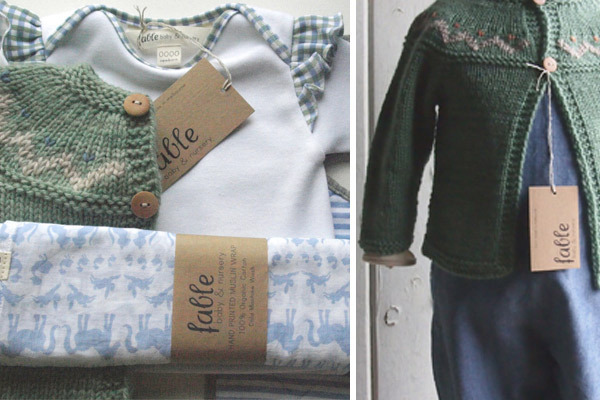 Rockrose Handmade is a very proud stockist of Fable Baby and Nursery, and I wish Prue and Phoebe all the very best! !